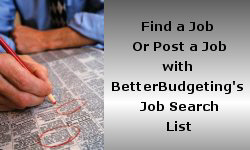 Here's our list of job search companies we've compiled to help our family and friends find a better job or new career. We will do our best to keep this list up to date as time goes on. Please do not copy this list but instead bookmark this page so you can visit it directly. Good luck to everyone who is still searching for a job. Never Give Up!!! Copyright © 2012, 2015 by Michelle Jones. All rights reserved.